To all mothers and “mother-lovers”: Happy Mother’s Day. Last week I battled, and fortunately dodged, tornados in Alabama on a road trip with daughter, Greta, and Aunt Jane – as close to my mother as I can get, aside from dreamland. Every bolt of lightening, every wail of the siren was worth enduring. Certainly because I was surrounded by family and memories, but also because I could indulge in favorite “nursery” foods: hop ‘n john, greens, anything-fried-you-name-it, and grits – oh, those grits! – loaded with shrimp, butter, and andouille – the holy trinity of soul. 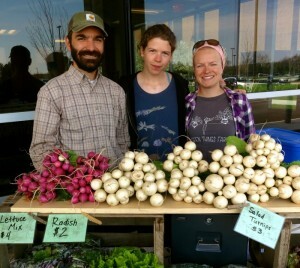 Seasonal produce from Green Things Farm. My sister-in-law made easy greens one night, using bags of collards and bacon, which inspired the following recipe. Upon my return to Ann Arbor, I purchased a Japanese varietal of turnips and their greens called Hakurei from Green Things Farm – a local farm that sells their produce every Wednesday at The Farm at St. Joes, as well as many other area farmer’s markets. Love that St. Joe’s puts their money where their mouth is: in disease prevention; the hospital actively grows their own produce and supports local farms, thus promoting healthy eating habits. So great that St. Joe’s has taken such a massive initiative to promote healthy eating habits, via their farm and market. These are undoubtedly the best turnips I’ve eaten in my life. 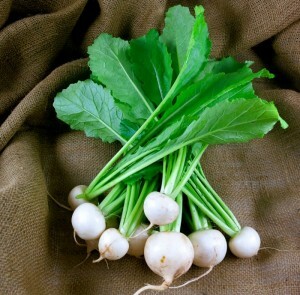 A bit less spicy than their brothers, the sweet bulbous turnips and their greens can be eaten raw or cooked, per recipe below. The turnips don’t get much bigger than the size of a golf ball, and the best thing about them is they don’t need peeling. Low-labor! The skin is as tender as the flesh. My husband, Richard, and I have been in turnip paradise the past couple of weeks (we’re very good customers), and I’m happy to be spooning them up for Mother’s Day. I realize this is not traditional Mother’s Day fare. So here are some other (quite healthy for the most part) Mother’s Day blogs from years gone by: Waffles with Warm Strawberry Compote, Double Chocolate Chip Pancakes with Strawberry Syrup, Steak Diane, Grilled Salmon with Edamame and Oranges. With a sharp knife, separate turnips from greens. Wash greens and chop into 2-3 inch pieces. Scrub turnips and leave whole. Reserve. In a heavy-bottomed stock pot, fry bacon over medium-low heat with onions. Add oil to pan, if needed, to keep onions from sticking to bottom of pan. Cook, occasionally stirring, until bacon begins to crisp and onions soften. Raise heat to high and deglaze pan with half of the vinegar, whisking bottom of pan to remove any stuck bacon bits. Add 8 cups of water, remaining vinegar, and greens to pot. 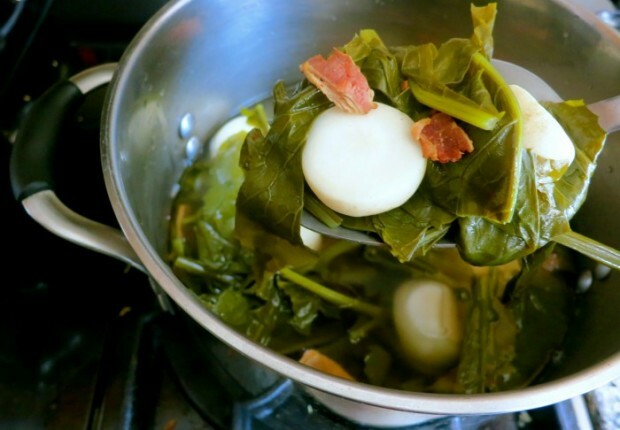 When greens come to a boil, stir, then reduce heat to simmer and cook 15 minutes. Add the turnips and continue to cook until turnips are tender. (Note that if turnips are dissimilar in size, add the largest first and cook 15 minutes or so. Then add the smaller ones.) Season to taste with kosher salt, if needed, and freshly ground pepper. Pepper vinegar is a nice condiment to pass, if this is available to you. * About 16-20 turnips. Hakarai turnips, preferred. If not available, use baby turnips as an alternative.